The Cordoba 20CM Concert Ukulele is a mid-range ukulele great for beginners and experienced ukulele players alike. Cordoba is a widely respected stringed instrument manufacturer known for their ukuleles and guitars alike. The focus of our review today is from their “20 Series” of ukuleles, which come in soprano, tenor, concert, and baritone sizes. All of the 20 Series ukuleles have are made from Mahogany with a solid top. 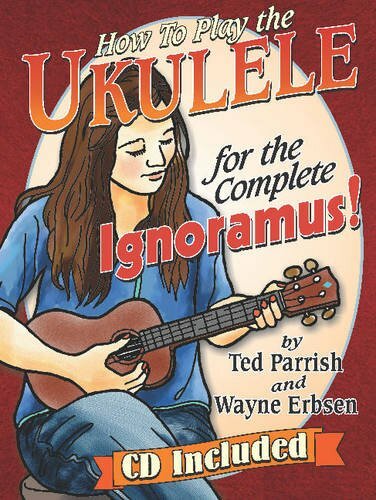 How to Play the Ukulele for the Complete Ignoramus is a new book for newcomers to the ukulele which covers all topics a beginners should know, written by Ted Parrish and Wayne Erbsen from Native Ground. This book is just over 100 pages long and comes spiral bound on large, 9″ x 12″ pages. This book also comes with an audio CD with over 60 tracks which will help teach you the material from the book, which is a major benefit when it comes time to understand the rhythm or timing being described on the page.